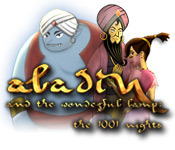 Aladin and the Wonderful Lamp: The 1001 Nights is rated 2.6 out of 5 by 9. Rated 5 out of 5 by fredandethel from Attractive and interesting I've already enjoyed two other games in this series - Around the World in 80 Days-The Challenge, and The Three Musketeers-D'Artagnon and the 12 Diamonds, but this is my favourite (OK, I'm a sucker for a beautifully drawn Arabian Nights tale). I found most of the mini games original and needing some thought. The storyline held my attention, Aladin has unexpected ups and downs, a bit like Kismet. Rather too much dialogue, but you can click through it. I read most of it first time through but will be glad to skip more of it when re-playing. I don't know what language this was written in, but one or two clues got lost in translation - "arc" turned out to be a bow - as in bow and arrow! - got mixed up with rainbow?? Rated 4 out of 5 by Nana6177 from Beautiful Graphics, Fun for HO Fans... Classic middle eastern fairy tale. Primarily a HO game with a few puzzles. Graphics are beautiful and clear. Full screen does NOT fill 15” laptop. You have the option of playing timed or not. HO list is not fixed and new items will appear as you click off old items. There is a click penalty. There is a button to the left that will allow you to zoom in one level, then back…..you can also move the screen right, left, up or down by holding down the left mouse bottom and sliding, all of which will be necessary as some items are rather small. At bottom left is a red button, it is your “clue” (or hint) button, you are given a limited amount of clues, but can add to them by finding a bonus item in each scene. Music is different than we normally get, lovely, traditional middle eastern. There are no voice overs, but has ample text. The characters are cartoon characters, cute. HO fans should enjoy this, relaxing music and great visuals with challenging but not aggravating HO scenes. Rated 3 out of 5 by arnold1049 from ALLADIN DOESN'T GET THE PRINCESS IN THIS VERSION Funny twist to the pauper becomes king story where Alladin doesn't end up with the princess. And two genies are involved, one in a ring and one in the lamp, setting up a good genie/bad genie scenario. This game would appeal more to kids than adults. Very simplistic play and way too much dialogue. 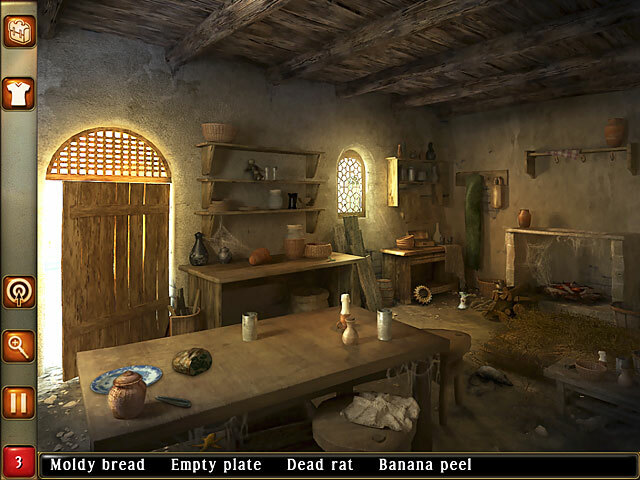 Simple puzzles and simple hidden object scenes. Scenes were revisited several times, resulting in a lot of back and forth that was aided by an arrow in every scene directing you to the next location. After finishing a hidden object scene, there was always one last item to find and this last item sparkles immediately, thus eliminating any challenge, There were two levels of play, timed and untimed, The timed option was impossible to play; even if I could find the objects that fast, I couldn't move and click fast enough to beat the clock, Not a very good game; use a coupon if you really think you want to play it. Rated 3 out of 5 by pennmom36 from Aladdin's Mischievous Adventures HdO Style I would just like to point out that the title of the game shows the main character's name spelled Aladin but in the game they spell it Aladdin, just saying! I have played several of these Hdo games before and I have the same complaint with most of them. The objects are entirely too small and the graphics aren't very good. Some but not all of the scenes can be clicked and dragged to zoom into a particular part of the screen and you certainly need this feature or a magnifying glass. 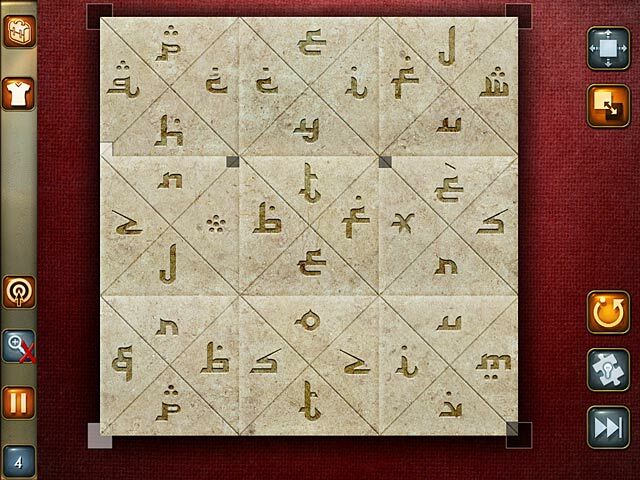 This game is centered around that mischievous orphan, Aladdin and the wonderful lamp (magical) with a wish granting genie. Some of the items keep flashing to indicate that the item will disappear if clicked on so you can find the item hidden behind. 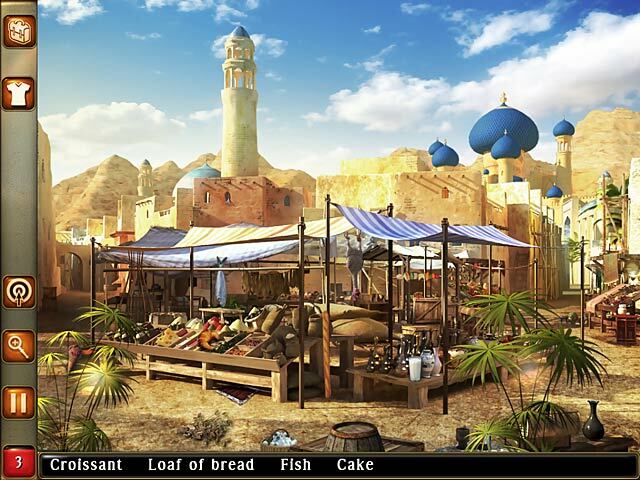 The game has a great adventure story but this type of hidden object game is outdated. Rated 3 out of 5 by kathiebee from Too Small This would be a nice game, a pleasant break from the "Doom and Gloom" games that abound lately, except I found the hidden objects too small, and difficult to find. I have a large widescreen monitor, and it still was difficult for me, so I don't know how people with the smaller sized monitors would manage. Rated 2 out of 5 by Rebr2009 from HOS, HOS, and more HOS. Kids game. Classic story of Aladdin, cute, colorful,crisp graphics, appropriate music, but repetitive. Almost only HOS, nothing challenging. It would be Interactive if not shine what has to be removed from the front of objects ... and to make matters worse, the last object to be found glows! Collect stars - they are hints. Very few mini games, which are extremely well known and easy. For children it might be good! Rated 1 out of 5 by Boopala from This is for 2xblack_bird Not sure if you are still on BFG, since this was back from a few years ago. But, I was trying to find some half way decent HO games, as I keep forgetting to use my free game coupons before they expire, have lost a few over the last year :(.... (sure wish they offered it for the CE, cause those are my favorites - or at least let you use the coupon towards one, even if it is not the equal price and you just pay the difference) and came across your most delightful, hilarious review I have ever read. So funny was it to me that I read it to my husband, but it was hard to get it out as I kept laughing so hard. Then I noticed you are from England, I sort of figured there was a high chance that some one from the good ole' USA hadn't written and they hadn't. I am not insulting all in the USA, certainly not myself ;), it's that we have lost what I consider some great laughs and it goes by the name "Wit". Yes I realize you were serious near the end, but the wit is greatly appreciated in your wording!!! Hats to ya! Rated 1 out of 5 by 2xblack_bird from Oh Dear Oh Dear indeed. It is not possible for every game to be good. There are: The excellent. The very good. The good. The average. The mediocre. The poor and lastly The why bother. This game is so bad it doesn't even merit the why bother category. Flat graphics. Mainly all HO's of the find objects by name variety. Yawn. A very dull and boring game. I quit the demo after 5 minutes for fear of shooting myself! It was that bad. Unfortunately I had to give this game 1 star as there is nothing lower. Find out what the mysterious secret kept in the marvel’s cavern is in Aladin & the Enchanted Lamp, a fun Hidden Object game!